A Winship fellow from Emory University School of Medicine's Department of Hematology and Medical Oncology and two residents from the Division of Surgical Oncology in the Department of Surgery are the recipients of this year's Nell W. and William Simpson Elkin Cancer Research Fellowship and the Chester Rochfort Scholarship. Clara Farley, MD and Ashley Staton, MD were each awarded a Nell W. and William Simpson Elkin Cancer Research Fellowship. Cecilia Ethun, MD was awarded the Chester Rochfort Scholarship. The awards are given out annually to extraordinary trainees (MD or MD/PhD) engaged in cancer research or clinical care at Emory. Each award comes with an endowment of up to $35,000 to help cover salary, laboratory costs, and other research-related expenses, such as travel to conferences and meetings. 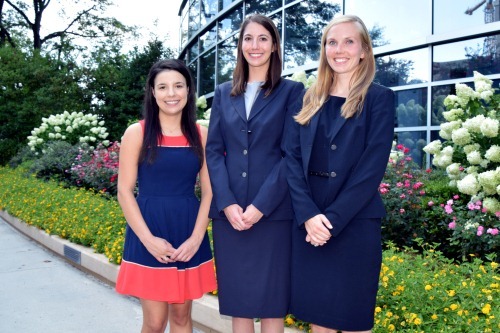 Pictured: Ashley Staton, Cecilia Ethun and Clara Farley.